This is one of the reasons why I really appreciate modern progress and medical achievements are a huge part of it. Xiao Wei had an accident and lost his right arm, but as his severed hand needed some time to heal, surgeons couldn't reattach instantly. For the hand to heal it needed a constant blood flow, that's why they temporary attach it to arteries in his left ankle. This kind of reattachment surgeries are quite rare, but Chinese surgeons are suppose to be very skilled in these kind of procedures. 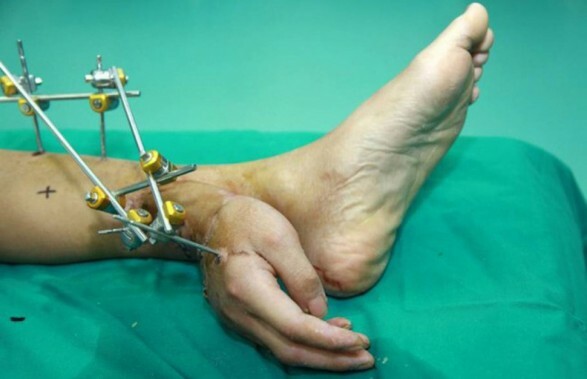 And what makes this particular case even rarer is the surgeon's decision to attach Wei's hand to his ankle.